By Xah Lee. Date: 2014-03-19 . Last updated: 2019-02-01 . 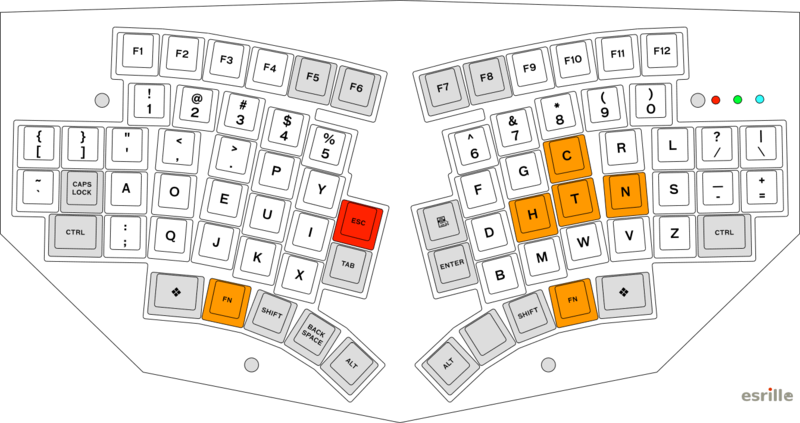 The Esrille New Keyboard came out around 2013. Esrille New Keyboard, with Japanese labels. 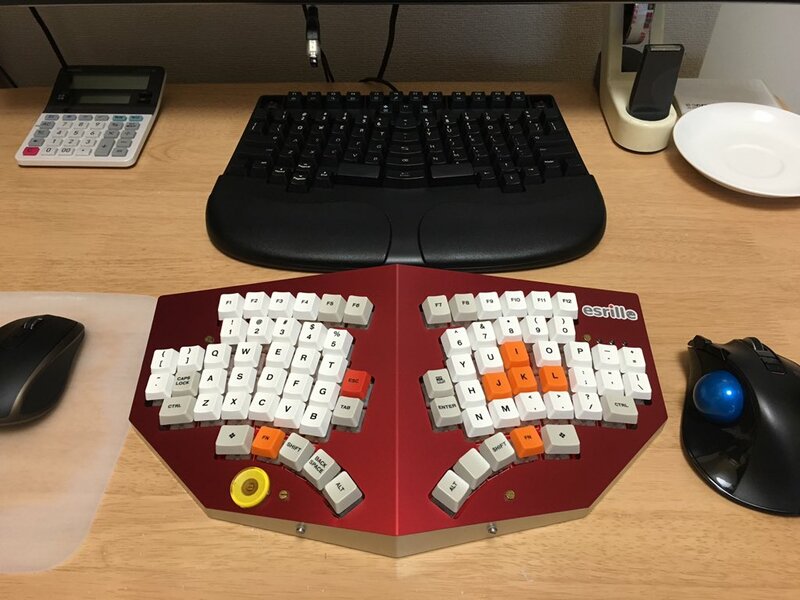 Esrille New Keyboard is from Japan, designed by Shiki Okasaka, from his company Esrille. 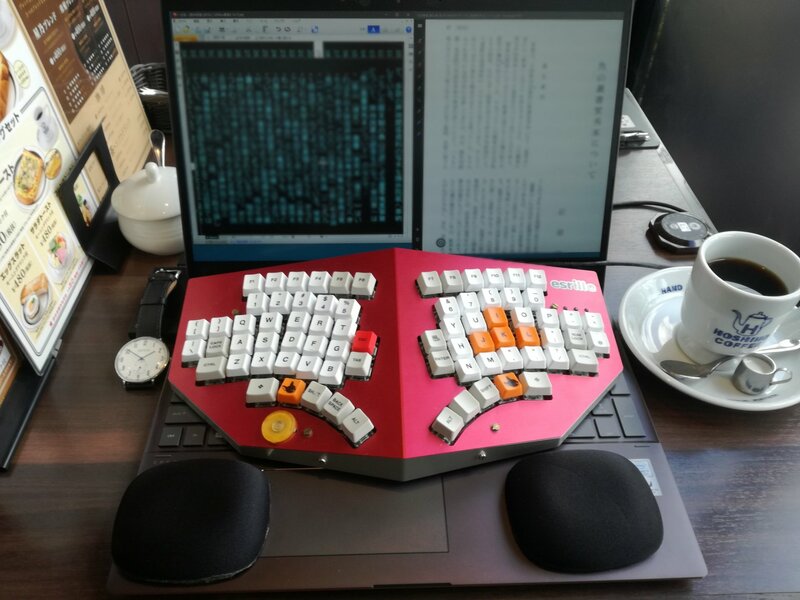 Each side has 38 keys. 6 are function keys, 6 are thumb keys. Size L: Standard 18.8 mm key spacing. Size M: 17.5 mm key spacing. The physical size of the whole keyboard is the same for both sizes. 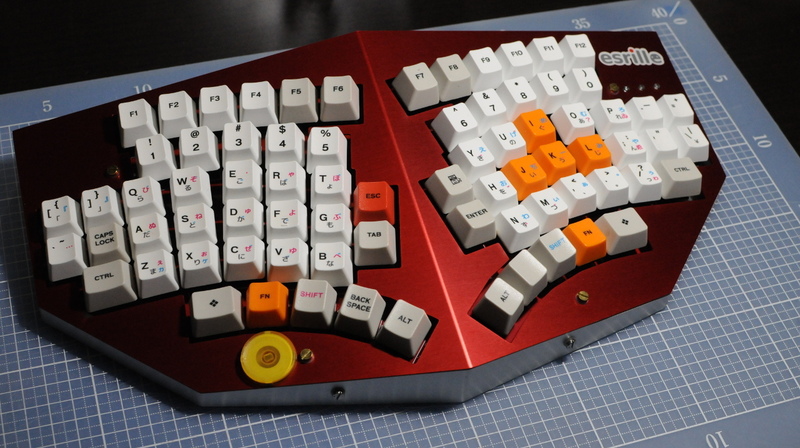 The design of Esrille New Keyboard is much influenced by Japan's M-Type keyboard and TRON keyboard. Esrille also supports several Japanese input layouts, including M-type and TRON. The max number of keys that can be pressed at the same time, is 6. You cannot program the keys easily. However, the company provides instructions and tools to do so. Basically, you need to be a computer programer to do so. Q: How can I customize the firmware? Download and install the MPLAB X IDE and MPLAB XC8 Compiler from the Microchip web site. They support Windows, Mac, and Linux. Note the current NISSE firmware is built with XC8 v1.34 in the free mode. Download the NISSE firmware from GitHub ▶. Open the project firmware/third_party/mla_v2013_12_20/apps/usb/device/hid_keyboard/firmware/MPLAB.X from MPLAB X IDE. Now you're ready to build your firmware. Esrille is among the many new keyboards invented after 2010. They have one feature in common: symmetric, many thumb keys, and mechanical keys. Here's a review by jbm. I have an Esrille NISSE and love it. I've been using it full time (6-10 hours a day, 5-6 days a week) since 2014-09 . Side note: I believe I was actually the first person in the US to order one. It was before they were able to ship assembled boards internationally, so I ordered it as a kit and assembled it myself. I forget where I first saw it — maybe Xah Lee's blog - but the design was immediately appealing to me. 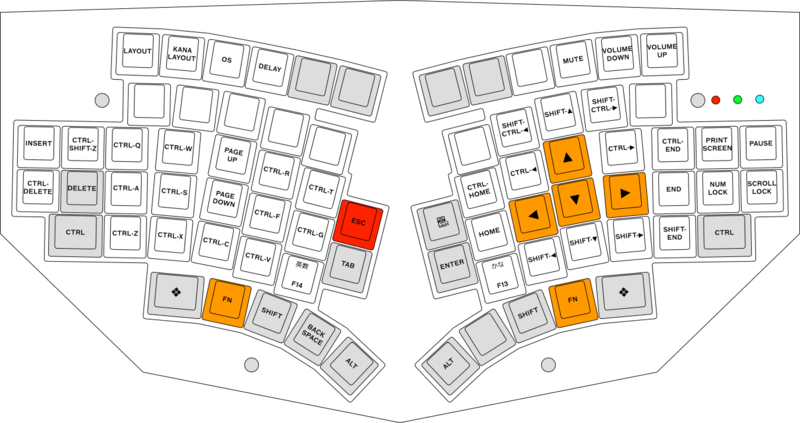 The other ergo boards I've used extensively are the Ergodox and Truly Ergonomic Keyboard. I like them all but the Esrille has been the best fit by a wide margin. Built-in tenting. 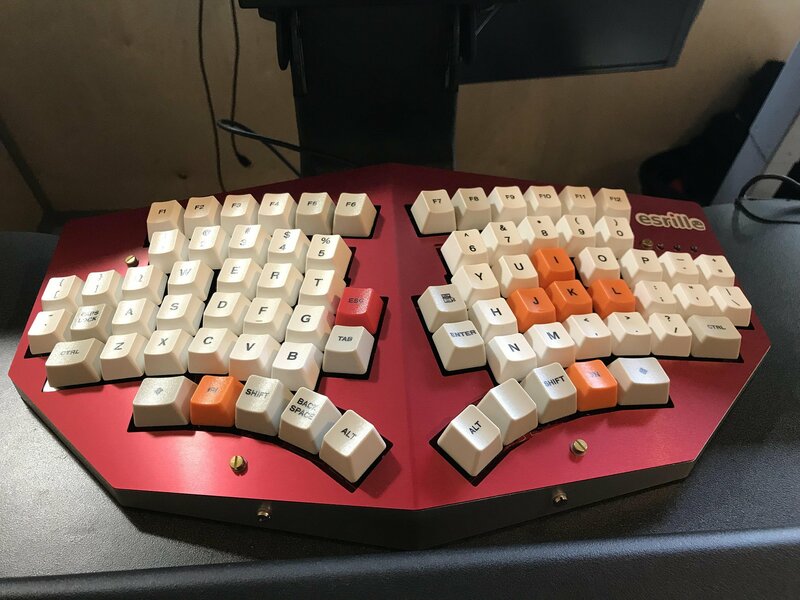 You can obviously tent an Ergodox, but the Esrille's shape works great for me as is, and I like not needing another piece. Also, I was surprised how expensive it is to have a tent printed, at least from the places I cheked. Subjectively, I can tell you the Esrille is definitely the most comfortable for me. I used to experience some level of discomfort 1-3 out of most weeks, despite fairly good technique, regular exercise, breaks every couple hours, etc. I honestly don't remember the last time I experienced any discomfort typing since switching to the Esrille. This is less important, since it's something you can always change, but I'll also mention that I've been very happy with the default layout on the Esrille, including the function layer. I fully expected to reconfigure things, just because I usually would, but in practice there hasn't been anything I've wanted to mess with. Let me know if you have any questions about it — I'll be happy to answer any I can.